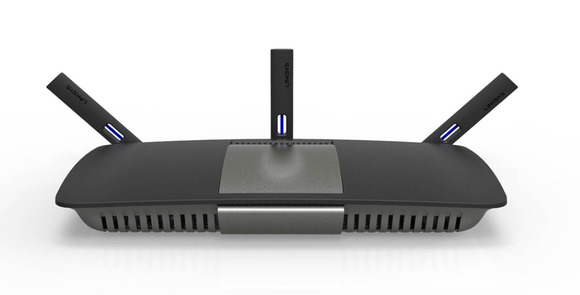 Belkin announced the Linksys EA6900 Wi-Fi router Thursday at the IFA conference in Berlin. It’s the first Linksys-branded product to come out of Belkin since the company bought the Linksys business unit from Cisco last March. As router manufacturers are wont to do, Belkin also christened the device with a more elaborate second name: The Linksys Smart Wi-Fi AC1900. Why do companies do this? You’d think they’d have a hard enough time getting consumers to remember one name for a product. Whatever you decide to call it, the latest device from Belkin is a concurrent, dual-band, 3x3 router. That means it can operate two separate networks simultaneously (one based on the new IEEE 802.11ac standard and a second based on the older IEEE 802.11n standard), and that it provides three transmit and three receive spatial streams to support physical data rates of 1.3 Gbps (for 802.11ac clients), and 600 mbps (for 802.11n clients). The fastest 802.11n routers I'm familiar with top out at 450 mbps (150 mbps per spatial stream), so Belkin is apparently using a new chip that supports 256-QAM modulation to boost that rate to 200 mbps per spatial stream. But a network client must also be capable of handling 256-QAM modulation to achieve that top speed, and that's not common on older hardware. And as is always the case with Wi-Fi, real-world data rates on both bands will likely be much lower. It’s always exciting to see external, removable antennas on routers. Too many router manufacturers think about home décor before performance, so they hide the element that has the greatest impact on throughput and range—the router’s antennas—inside the case. I’m happy to see that Belkin allowed its engineers to outfit the EA6900 with external, removable, dipole antennas. Removable (and therefore upgradeable) dipole antennas are among the features that have made the Asus RT-AC66U my long-time favorite (Netgear, as you might have heard, has a very low opinion of it, but that’s another story). I might never upgrade my router’s antennas, but I like knowing that the option is available. Too many router manufacturers think about home décor before performance. The EA6900 is outfitted with an 800MHz dual-core processor, and it supports beam-forming technology to help the router and client establish the best wireless connection. (You can get a brief explanation of how beam forming works from this Macworld article.) The new router is outfitted with a four-port gigabit switch, one USB 3.0 port (which would be useful for sharing storage over the network), and one USB 2.0 port. Unfortunately, neither USB port can used to share a printer. The router is Wi-Fi and DLNA certified, and is compatible with both the Windows and Mac operating systems. As with many new routers these days, you won’t need a computer to set the router up. Belkin provides free Android and iOS apps so you can use your tablet or smartphone instead. Belkin has also launched a new USB Wi-Fi adapter. Belkin also announced a new 802.11ac wireless USB network adapter, their model number WUSB6300. 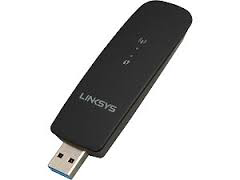 This device will allow you to upgrade any desktop or notebook PC to 802.11ac speed. The WUSB6300 is a 2x2 adapter, though, so 802.11ac speed is limited to 867 mbps and 802.11n speed is limited to 300 mbps. Update: While waiting for a fact-check from Belkin, I had speculated that the one of the EA6900's USB ports could be used to share a printer over the network. Belkin has since informed me that neither port can directly support a USB printer.